The rise of commodity prices for resources such as food and fuel among others and the forecasted shortage of supplies to support the increasing demand have brought several technological innovations to combat foreseeable crises in the future. One of these technological innovations is the utilization of algae to produce vegetable oil, biodiesel, bioethanol, biogasoline, biomethanol, biobutanol, and other biofuels. Algae has adapted to hostile environments and can be grown in places where higher plants cannot survive such as deserts, wastelands, and places like the Imperial Valley and other dead zones on the surface of the earth. Algae has adapted to such environments and spent the last billion years surviving in places where no other organisms can. Recent technological advancements is taking advantage of such evolution and making use of places where nothing grows through the development of Algaculture, the method of farming algae. Algaculture requires a lot of sunlight, a fair amount of water consisting of nitrogen and phosphate, and carbon dioxide emissions in order for algae to grow. The least expensive method of producing algae is through the use of open ponds containing water with nutrients. Algae makes use of nutrients, such as nitrogen and phosphate in order to stimulate its growth and these elements are very abundant in waste water. In order to maximize its production, algae ponds are often lined with an industrial fabric that can withstand the elements present in the algae environment. Western Environmental Liner offers the perfect product to line algae ponds or tanks. Reinforced Polypropylene (RPP) can often be perfect for this application. This product comes in 36 and 45 mil thickness and can withstand the adverse effects of nature. Depending on the thickness, it comes with a limited 15 or 20-year UV and weathering warranty when exposed to the sun and can last well over what it’s warrantied for. RPP is an excellent product widely used in applications such as landfill liners, waste water treatment, lagoon liners among many others. RPP is fish friendly and is NSF approved for potable drinking water. Its tear and chemical resistance assures its durability and dependability. Reinforced Polypropylene is heat seamed together so that the pieces molecularly bond, making it impermeable and leak proof. 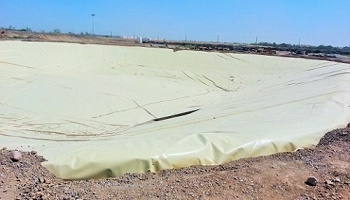 Western Environmental Liner also offers an alternative fabric for algae pond liners. Our Aqua series of reinforced polyethylene, RPE is a cost-effective way of lining multi-acres of algae ponds. Woven coated reinforced polyethylene comes in various thicknesses, from 12 mil to 30 mils. This product consists of high density polyethylene (HDPE liner) scrim coated with low density polyethylene coating, making it very durable and fairly impermeable. Our Aqua series can withstand the harsh effects of nature and has a good UV resistance. This material can last over 20 years if buried and depending on the thickness, can last well over 10 years if exposed. This material likewise comes with up to 10 years of limited UV and weathering warranty, based on thickness. Whether you are trying to prevent pond water seepage or trying to contain biofuel, Western Environmental Liner can help you with your lining needs. With our multiple factories located in Tolleson AZ, Romulus NY, and Great Bend KS, we can easily manufacture your liner into whatever size and shape you need. We can create this into one piece panel for your easy installation or we can do a turnkey installation for you. We can also fabricate boots to protect water inlets and perfectly line pipes that are in the pond. For any questions and inquiries, feel free to contact us today and one of our liner experts will be happy to help you.